Super Bowl parties should be casual and fun. 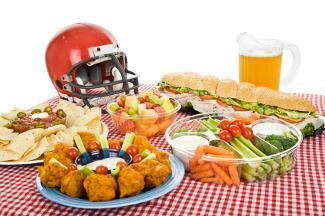 Super bowl party ideas should be fairly simple and easy to put together, since the star of the party is the game itself. Guests will arrive ready for a good time, so all you need to do is set the scene and provide the food! There are two basic themes you can go with for a Super Bowl party: NFL teams or an overall football theme. If your hometown team has made it to the big game, that's the perfect opportunity to haul out all of your swag. Team colors - You can choose only the team that you're rooting for to win the game, or the colors from both teams. Hometown team - If your team is playing in the Super Bowl, use its logo, mascot, colors, and other items to decorate with. Make sure everyone has t-shirts, hats, or flags to cheer the team to victory. NFL teams - In the interest of fairness, you can use logos and other images of each NFL team to set the scene for your party. That way everyone in attendance will have his or her favorite team represented, even if they aren't playing. Football theme - There are lots of football-themed items available at party supply stores, so choosing an overall football theme should make things really easy. You could also combine a couple of themes by using one set of team colors along with some items decorated with a football motif, for example. Since Super Bowl party ideas are generally pretty straight-forward, there isn't a lot of preparation or advance planning required. Still, you'll want to make sure that everyone has a good time and that all the details are looked after. Here are some more tips to make sure that your party goes off without a hitch. Invitations - Since this is such an informal gathering, you can generally invite friends by word of mouth, by phone, or by e-mail. Ask guests to RSVP so that you'll have an idea of how much food you'll need. Decorating - A few large items such as team banners and flags should do the trick here. You could also hang team jerseys, or print out team logos using your computer. Food - Make sure you have plenty of great items available for people to munch on during the game, halftime, and commercials. Televisions - If you have the space and multiple TVs in your home, consider moving them all into the party room. Keep the volume up on only one television, using an extra set of speakers if possible to make sure everyone can hear it. The extra televisions should be placed around the room so that all of your guests have a front row seat for the game. Entertainment - The main attraction will be the football game, but if children or others who aren't big football fans will be in attendance, it would be a good idea to have an alternative available. Consider setting up another room in the house with tables, chairs, and board games, or provide a corner of the main party room for those who wish to sit and chat. The great thing about Super Bowl parties is that, once you've set up all of the food and seating, there's not much left to do but enjoy the game with your friends. It's a great opportunity to catch up with everyone, share the joy or agony of the game itself, and have a good time.